Google wants more small businesses to claim their listing profiles on Google Local (which is basically listings that pop up in Google Maps and local search results). To entice them, starting tomorrow it will give local businesses in the real world with physical addresses a free dashboard akin to what Websites get for free with Google Analytics (see screenshot above). Except that it will show stats such as how many times their business comes up as a search result, how often people click through, as well as how many times people generate driving directions to their business son Google Maps and where those people come from. In return, all they need to do is claim and verify their listings at the Google Local Businesss Center. It takes about as much time as setting up a new email account, maybe a little more. Google gets clean data (and, thus, better results), businesses get free analytics and an opportunity to train Google’s search engine. Right now only a few hundred thousand businesses in the U.S. have been claimed out of approximately 20 million. The other benefit to Google is that the more that small businesses can measure the impact of search, the more likely they will be to buy search ads. 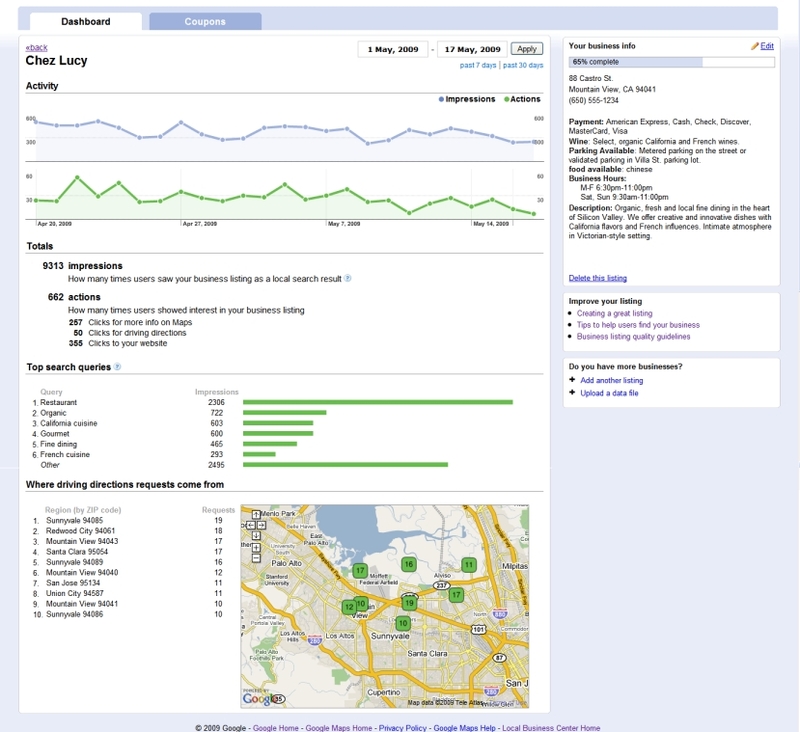 The dashboard shows the top search queries that result in a business’ listing showing up. The next obvious step is to start buying those keywords or optimize a business’ site to make sure they are on the page. There is no integration yet with Google AdWords (like there is on Google Analytics), but you can see that one coming from a mile away.